Windows Mail Backup Express is a powerful backup software which can backup all your messages and settings from Windows Mail. E-mail Investigator Express is an e-mail address validatorwith the ability to produce detailed reports of its progress during the investigation process. these reports can then be saved as plain text or HTML, and printed in either format. KLS Mail Backup is an easy to use backup program that allows you to back up and restore your Windows Mail, Outlook Express, Mozilla Thunderbird, Firefox profile files. The backup files are stored compressed in standard Zip files. 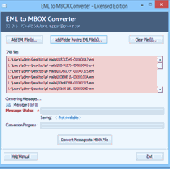 Successfully move EML to Thunderbird, you can try EML in MBOX Converter that absolutely moves messages from Windows Live Mail, Windows Mail, Outlook Express to Thunderbird with all header information. To migrate IMM files into Windows Mail, Outlook Express, Windows Live Mail, Thunderbird, Apple Mail, Entourage and Outlook, use IncrediMail Migration utility that could proficiently migrate IncrediMail to other emails format with attachments. 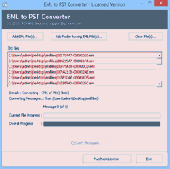 Use EML to PST Conversion for importing emails from EML of Windows Live Mail, Windows Mail, Outlook Express into PST Outlook - 2013, 2010, 2007, 2003, 2000 etc. Do you need to copy EML files to Thunderbird? Then utilize EML to Thunderbird Converter that supports to copy Windows Live Mail, Windows Mail, Outlook Express into Thunderbird with all attachments. The IncrediMail Conversion Tool is powerful program to easily convert .IMM IncrediMail emails into Thunderbird, Windows Live Mail, Outlook Express, Mac Mail, Windows Mail, Entourage, EM Client, etc. Free program for cleaning up your email from ugly >>> and other garbage from forwarded email. .
Free program for cleaning up your email from ugly >>> and other garbage from forwarded email.